Ever since I saw a picture of Mount Sneffels, I knew I wanted to conquer it. Labor day this year, I finally got my chance. After driving all night long (roughly 6.5 hours from Boulder past Ouray into the San Juans) we reached as far as the truck was going to take us up the dirt mountain road. We stole an hour or two of sleep before starting our hike about 4:30am. The San Juan mountain range was unlike any other range I have previously adventured in and Mt. Sneffels has been, by far, my absolute favorite peak. It was intense and at times really scary, but it was the most exciting and the most beautiful yet! I figured it was only fair to share a couple pictures even though this blog is about my painting and not all my awesome mountain activities (if that were the case this would be updated at least once a week). At one point during our return from the summit, I turned around to look back at the mountains behind us and I caught a reflection of a peak in the puddle we had just passed over. I immediately took a picture and then instagrammed it once I had cell phone reception. 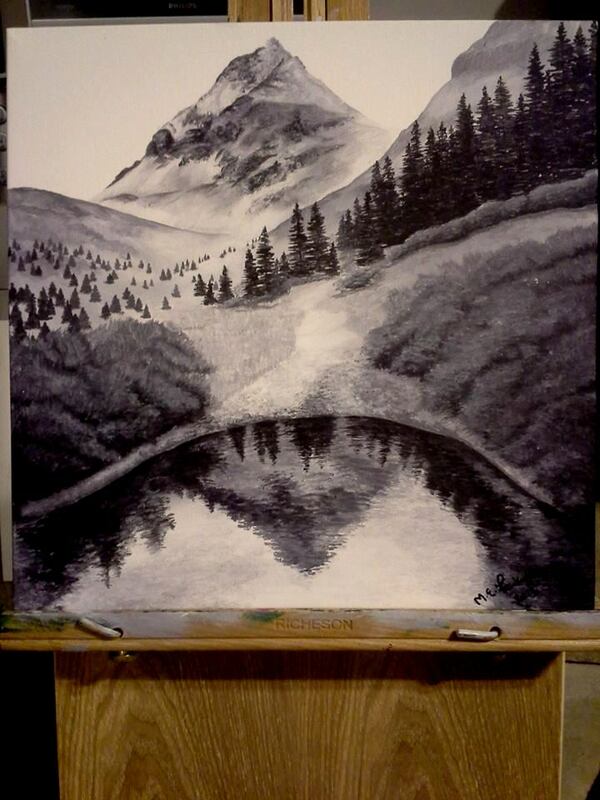 I knew I wanted to recreate that black and white photo from my hike, but I have a long list of paintings I need to complete before Christmas so paintings for myself have been set on the back burner. 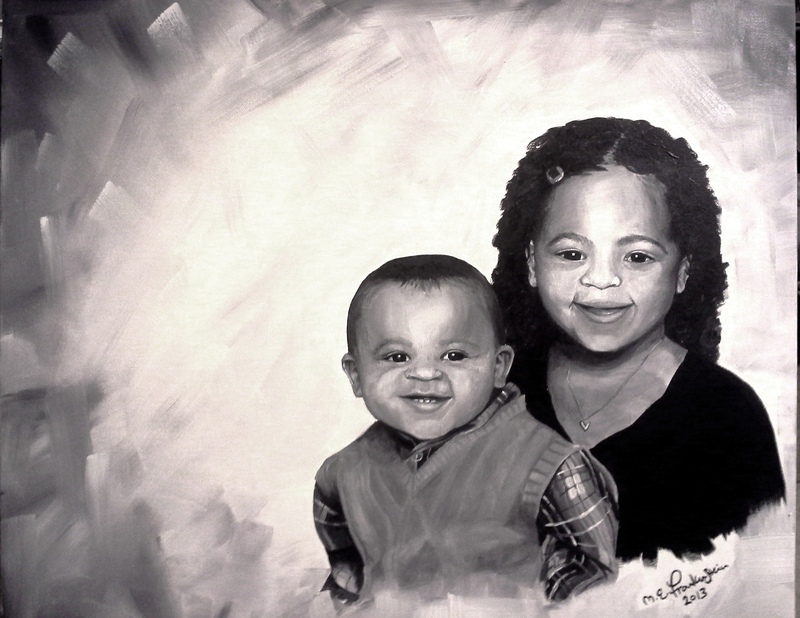 When I was back in WI in August, a family friend commissioned a piece of her grandchildren. I don’t know how I was convinced to take on this endeavor. 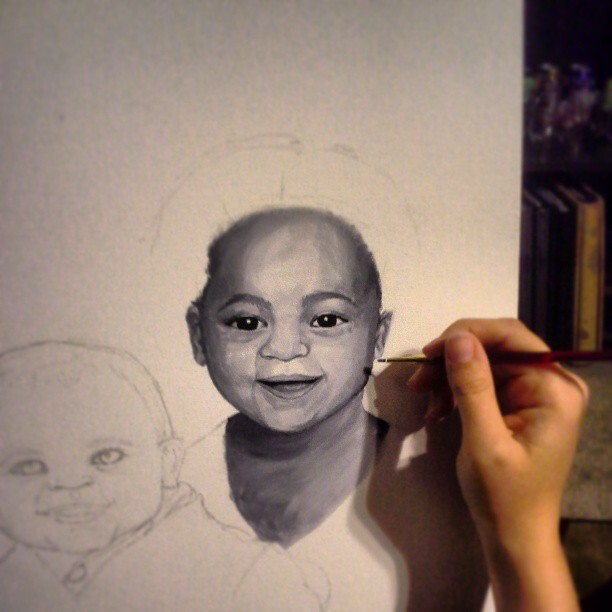 I hate painting people. It frustrates me more than anything else, but I digress. I decided an outlet for the frustration caused by this portrait would be working on a side piece that would keep me happy i.e. the picture from Sneffels. I’ve got to be honest. The piece is called “Sneffels”, but the peak in this painting is not mount sneffels. It’s just some shorter peak that’s visible on the hike up to Sneffels. I’m really happy with how this piece turned out. I love black and white and I love painting trees so it was a perfect piece to calm frustrations. The puddle was definitely the most intimidating part, but I’m proud of the finished work. Sneffels. 2013. Acrylic on canvass. 14×14.